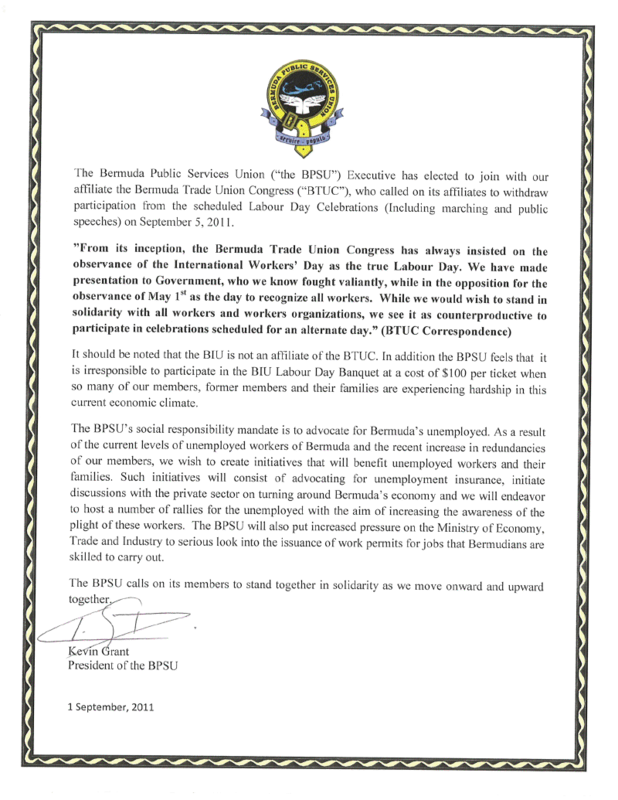 The Bermuda Public Services Union [BPSU] said they have elected to join with the Bermuda Trade Union Congress [BTUC], who called on its affiliates to withdraw participation [inc. marches and public speeches] from the scheduled Labour Day celebrations on September 5th. The BPSU said “it should be noted the BIU is not an affiliate of the BTUC.” The BTUC consists of the BPSU, Bermuda Fire Services Association, Police Officers Association, Prison Officers Association, Bermuda Union of Teachers, Bermuda Electrical Supply Trade Union, the Association of School Principals and the Bermuda Federation of Musicians and Variety Artists. Sounds like they’re trying to distance themselves from Chris Sherbert and his Blind, Incompetent and Useless followers. Idiots…always tryna be in the spotlight. I HERD DAT ! ! Talk to em straight Mr Grant . This clearly does not bode well for Bermuda. Whilst the unions have each retained their autonomy, they collectively stand for the protection and progress of workers. In this case, the BIU are known to be the primary organisers of the Labour Day observances and the notice from the BPSU represents a clarion call against the BIU and by extension it leadership. A secondary issue that must be highlighted is that the call is a demonstration of the leaders in the community being unable to resolve their differences. Irrespective of the differences, there was surely an opportunnity for all parties to get together and resolve them. If we translate these actions to our young people, what example are we setting? In the reverse, what do we anticpate in future when the BPSU or the other unions have events? Is there going to be continued discord amongst our unions as we move forward? What will happen with issues of joint attendance and representation at overseas conferences etc – will there be a lack of cooperation. My request… whatever the differences, please get together and do what it takes to resolve the differences. Remember that whilst you are separate unions representing different workers, the employers see you collectively as labour. Your present stance is one of ‘divided we fall’. This is completely opposite from ‘Union’ and ‘United we stand’. @ Vote For Me Once again you have made some very important points. If this has been an ongoing issue, why did the past president of the BPSU sit on the committee last year to assist in the organization of the Labour Day events? Why is Mr. Ball (BPSU) now taking this action so late in the game? Mr. Ball usually gives directs the President and Vice President of the BPSU, as to what course of action to take. I am not sure if they are knowledgable enough to come to such decisions on their own. What is Mr. Ball’s hidden agenda? Or is he seeking to suggest that the BPSU is a powerful union? This decision was not made by the membership at-large. Mr. Ball and president of BPSU should have put the decision not to take part in the Labour Day events, to its members, for a vote. It now appears to be his decision. No this does not bode well for Unions in Bermuda, and it is hoped that they can get together to resolve such simple issues. As this matter is not complexed. The major issue regards on which day should Labout be celebrated? I am hopeful that good Union practice would have been to come to some form of agreement. After all they do expect that of others. You’re hilarious. It’s “all for one and one for all bruvvas and sistahs” right up until someone actually expresses their own opinion and makes their own mind up about something. Then you start to brand them as ‘not too smart’, ‘not honest’, it’s a ‘power play’, it’s ‘weak’, it’s ‘late in the game’, it’s a ‘hidden agenda’. Sometimes a cigar is just a cigar. Maybe it’s just that not all all union people want to be associated with the stuff Furbert has been doing. Guess who was the featured musician at the banquet on Friday… none other than Shine Hayward – President of the Musician’s Union and the Trade Unions Congress. I guess what is good for the goose is not good for the gander!! Go figure. bwwahahaha. It doesn’t bode well for Bermuda? Are you serious?!! It means, my little PLP and BIU shrills, that the BTUC and the BPSU think Brother Chris is a moron. It bodes extremely well for Bermuda. Whenever I hear calls for parties to come together and compromise, the underlying assumption is that both are drawing from a common set of views and values and can look to them to seek common ground and resolution. What happens if you are dealing with a party that doesn’t draw upon those views and values? Is one supposed to totally subvert their beliefs and standards to compromise with a party that is antithetical to those values you hold dearest? The call to compromise assumes that both sides are capable of acting rationally and in the best interests of those they are negotiating on behalf of. What if that is not so? What does one do then? What if refusing to compromise is the best course of action for the good of all? Also in attendence will be the “AHC”…Te BTUC and the BPSU are having a sale tonight at 5.pm on the corner of Court and Reid……………..
Hopefully another nail in the coffin of the militant leadership of the BIU. This is surely the most outright condemnation of their recent behaviour that could have been made public. Well done BPSU for making a stand. Divide and conquer! I’m just sayin. I agree, $100 for a plate ta food pushed in de middle of som large dinner plate is a bit much. Thot the call was to ‘tighten de belts” Shuda sold the tickets @ cost mate! Of the thousands unemployed in BDA, aren’t they those middle management, and regular poor folk ,who don got dat money ………zz? when u know that your mate is an idiot, are you gonna stand side by side or distance yourself. Grant and Ball may not be too smart in the long run. Unions worldwide always tend to work together, as there always comes a time when they need the support of one another. “Time will Tell”. It is best when Unions work on issues together and resolve them. To take on power positions is not good, as someone will fall later. As BPSU is not been honest regarding this matter, they should have addressed it sooner, rather than later. It looks like power-play is at work here by Mr. Ball who always directs/advises President what to say. BPSU has been known as a weak Union, that really does not fight hard for its workers, It would have been great to see this type of action taken as it related to real labour issues. Does the BPSU publish audited financials? Geuinely curious. I know there is a lot of politics involved within this dispute, but is it me or do most bermudians prefer the Labour Day holiday to be held in September. This is the only vacation we have between Cupmatch (first week of August) and Rememberance Day (11 November). This date is also celebrated by our neighboring countries (United States & Canada) as well. I honestly do value your stance, but September’s Labour Day holiday also signifies the start of school. I totally agree with your stance of boycotting the BIU banquet. I believe the BIU are responsible for many of the issues that are currently present within our island. Instead of of being a diplomatic body looking out for the welfare of their workers and Bermuda as a whole, they are radicals that jump at a chance to strike, which ultimately hurts Bermuda in the long run! It is always important to understand the facts of a dispute before commenting. Based on the public comments of President Grant of the BPSU, the decision to boycott the weekend activities was made by the Executive and not the membership. The BUT (teachers union) advised members to boycott Monday but feel free to attend the banquet on Friday. Guess who was then the featured musician at the banquet.. none other than Shine Hayward, President of the musicians union and the President of the Trade Unions Congress!! If you ask me we have a mess on our hands. Add to that the public statement by President Grant that the decision to boycott arose after ‘some enquiries by members’ which he did not want to specify. We also know that the last BPSU President Thomas helped to organise the weekend activities last year. If there was such a fundamental disagreement about the day to celebrate, the unions should pressure government to change the day back to May. In this case it seems as thought they have ‘cut off their noses to spite their faces.’ How short sighted for all of them!! I will be the first to admit that some of the recent actions by the BIU have been completely contrary to Bermuda’s best interests, but that is a different matter. At this time my focus is on dispute resolution and this current call for a boycott is a clear demonstration that those charged with resolving employment related disputes are ill equipped when it comes to resolving their own disputes. The Bible cautions against worrying about the splinter in someone else’s eye when you have a plank in your own. Me thinks the unions need to deal with some planks before focussing on the splinters in the eyes of government and the employers.